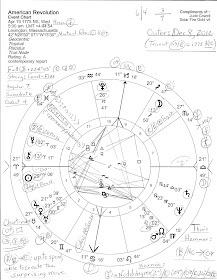 Chart shown: New Moon 23Tau09, May 13, 2010, Capitol Building Washington DC @ 9:04:19 pm edt; chart-ruler Jupiter 26Pis17 in 4th house with Uranus 29Pis31, and midpoint Mercury/Neptune 00Ari43 = Aries Point (AP); Hour of Saturn; Venus out-of-bounds. Mercury/Neptune = Uranus: inventions and inspirations; a sudden new ideas; a misguided imagination; going 'far out'; a sudden lack of ideas; using Astrology for greater understanding; gaining inspiration by use of rational analysis along with psychic help. 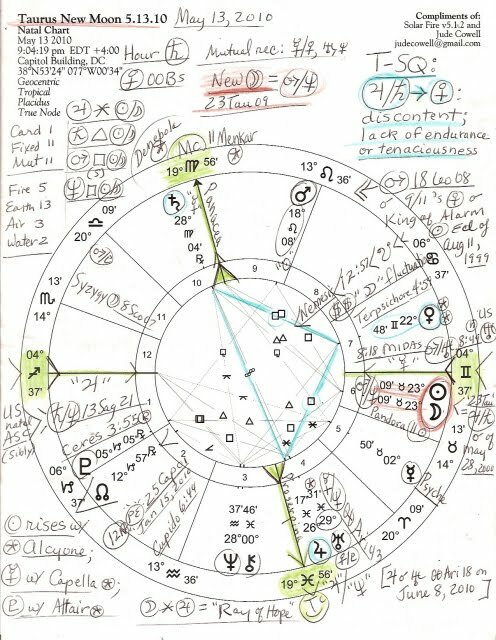 On May 13, a new cycle of daily activity begins as Moon and Sun conjunct @ 23Tau09 in 6th house of Daily Activities, Health, Work, Military and Police Forces, and other Service; the chart shown here is set for the US Capitol Building since this may apply to all of Washington DC as the District acts as the representative of the United States of America. New Moon = Mars/Neptune, a midpoint of confused motivations; deceptive or inspired actions; paralyzed activity; a lack of energy. 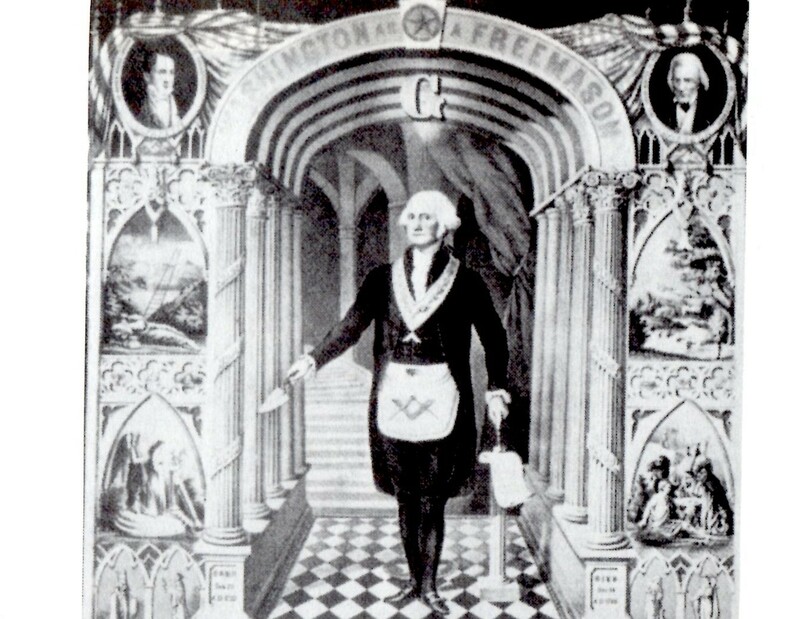 Thus two important midpoint pictures are formed with Moon ruling 8th house of Shared Resources, Big Money, Debt, Credit, Insurance, Transformations, etc; Sun ruling 9th house of Foreign Lands and Travel, Philosophy, Higher Education, Religion, and Foreign Enemies. Mars/Neptune = Moon: crooks; a danger of infection; weak, sick, or moody women; sensitivity; feelings of inferiority; nervous weakness; feeling off-course; indecision; apprehension about struggles with deceptive or misleading activities; fluctuating anger toward visions. Mars/Neptune = Sun: new plans are illuminated; situational changes; added effectiveness to the impact of a deception or an illusion; a noted, distinguished magician or mystic; weakened intensity of influential people; discontent; lack of willpower; the undermining of health; weak vitality or the dissolution of a body. So the above Mars/Neptune activities may be said to be masked or hidden by the lack of light of May 13's New Moon and certain activities may then surface or be revealed by the light of May 27's Full Moon! 3. conjunct Uranus (3A14) @ 00Ari18 on June 8, 2010; Uranus = AP indicates a time of historic breakthroughs in Science, Genetics, Explorations, Religion and Philosophy, Technology, Finances, Politics, Arts, Astrology, and more...these possibilities are expanded or increased by Jupiter's presence with Uranus @ AP. As you see, there are many factors worth noting in the New Moon chart including the influence of the earthy, materialistic sign of Taurus and its underbelly traits of intolerance and greed. But since you, dear reader, know a bunch about Taurean traits already, I shall skip to the one planetary pattern configured here in the New Moon horoscope: the Mutable Fixed Square between the opposition of Jupiter and Saturn and an apex Venus 22Gem48 in 7th house of Partnership, Legal Affairs, and Open Enemies. 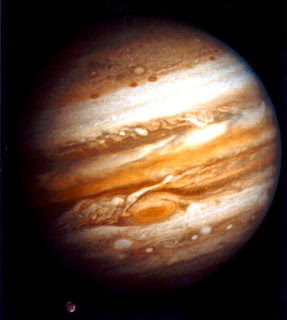 Jup/Sat = Venus: hypersensitivity about one's ego-position; a lack of endurance or tenaciousness; discontent; increased appreciation for the value of planning and organization; a touch of reserve; jealousy about recognition given to others. When Venus (values; evaluations; relationships; attractions; smaller amounts of money; revenge) is the apex or focal planet in a Mutable T-Square, we find persons who may be social butterflies possessing strong drives toward sociability and/or social awareness. Yet values may not be compatible with those attracted so relationships present challenging problems with emotional tensions, jealousies, and feelings of inequality. Apex Venus in T-SQ expects things to come easy with little or no effort since constant satisfaction is desired; complacency, laziness, and passivity are cautions. In a Mutable T-SQ, apex Venus indicates one who is fickle and uncertain of personal values; 'space' to emotionally breathe within partnerships is deemed a necessity, and the ability to come and go as one pleases is a must due to the restlessness of the Mutable quality. Yet if Venusian energies are well-managed in a Mutable T-SQ, diplomacy and fair play may result. Venus SQ Jupiter = indulgent and careless about responsibilities; outgoing when things are going well but obstinate and hard to deal with when they are not; in dealings with people compromise and adjustments are offered yet these may be empty gestures; resentful if forced to act; tends to be demanding; deceptive tactics may be resorted to in order to gain attention; skillful communications abilities are the greatest asset; feels suspicious of others' hostility, and anxious that they will try to take advantage; not overly generous due to a belief that generosity is 'not really appreciated'. Note: Venus out-of-bounds increases the planet's traits noted above especially where feelings of insecurity, inequality, or inferiority are concerned. And you may wish to read of the New Moon's Sabian Symbol at Midheaven, the Goal Point of the New Moon chart. Tr Saturn/Neptune = n ASC: noticing the pretenses or false intentions of others; confinement; a loner or one who feels 'out of the group'; oppressive family circumstances; a limitation of freedom; emotional suffering caused by others; illness. So you may wish to add insights to this analysis and I hope you feel free to do so in a Comment for this post. 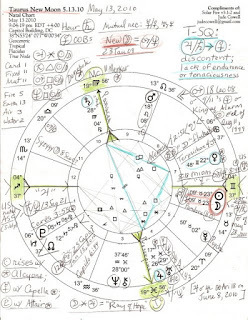 Or if you have an alternate analysis of May 13, 2010's New Moon in Taurus, email it to: judecowell at gmail dot com and I will happily consider publishing it here on SO'W. Until then, lay low this week during the Dark of the Moon when sneaky forces may be afoot and things may look quite different than they really are when cast beneath the shadows of the night. Mutable T-Square info from Bil Tierney's excellent book, Dynamics of Aspect Analysis. I am fascinated by this New Moon's position at the midpoint of Mars and Neptune, but can't seem to find anyone else but you talking about it. You don't say? i'm not certain how many astrologers use mdpt pics as often as i do but then again i keep my snoot to the grindstone too closely and seldom flit about to investigate others' work as i once could. Then there are time constraints which means i never feel a post is completed - who has time really? Real world jobs and all that and i grow weary with feeling Sisyphustical about blogging. So! Mars/Neptune is one of the mdpts i always check in Any chart along w/ others that join a planet/s or those that will be triggered in some way...oppositions to mdpts must be considered, too but i don't often ck squares unlesss it to the degree. All 29th degrs of any sign resonate with one another, etc...mdpts @ Card Pts are part of the 29 degr picture as well...so much to consider, yes?! Wat i don't do is find time to type all i should on each horoscope! Say, lm, if you have it, send along an article for my new Guest Blogger feature to be placed in the SO'W sidebar. A couple of astrologers have expressed interest so far in th eproject and i hope you'll consider it too!